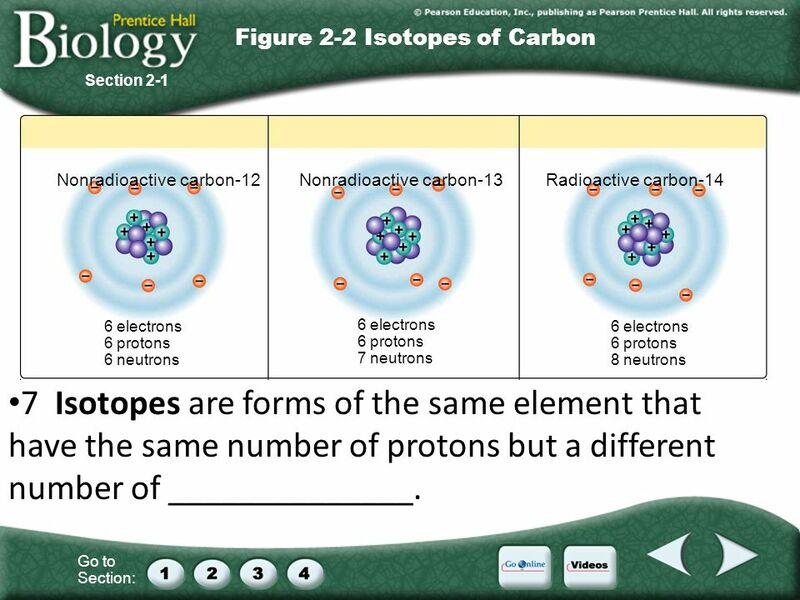 Go to Section: 2–1The Nature of Matter A.Atoms B.Elements and Isotopes 1.Isotopes 2.Radioactive Isotopes C.Chemical Compounds D.Chemical Bonds 1.Ionic. 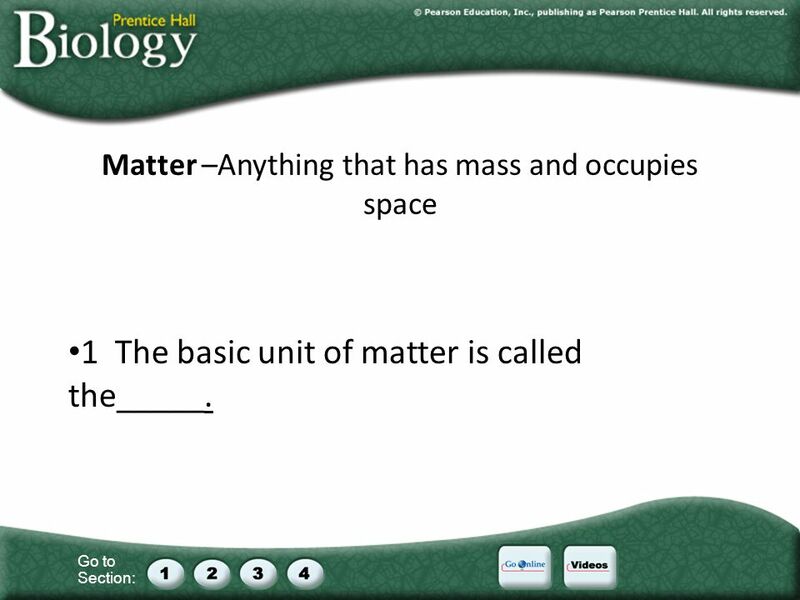 2 Go to Section: Matter –Anything that has mass and occupies space 1 The basic unit of matter is called the_____. 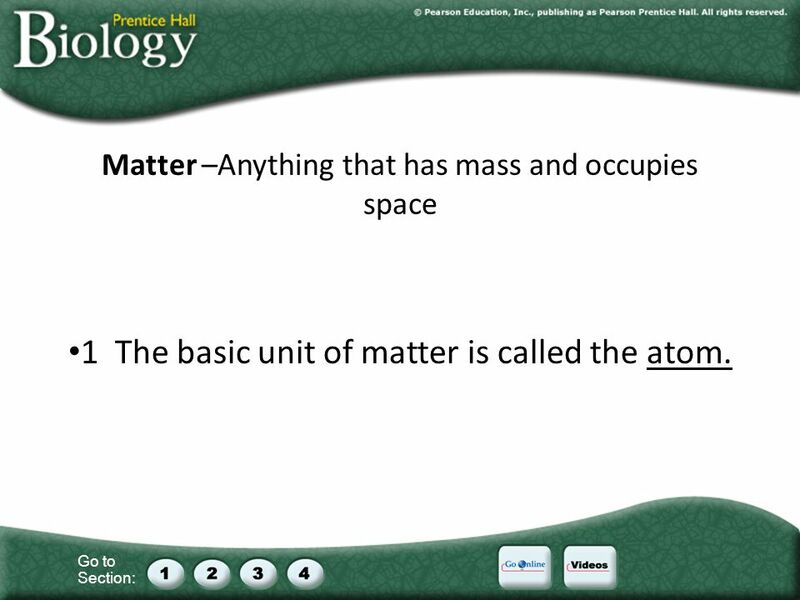 3 Go to Section: Matter –Anything that has mass and occupies space 1 The basic unit of matter is called the atom. 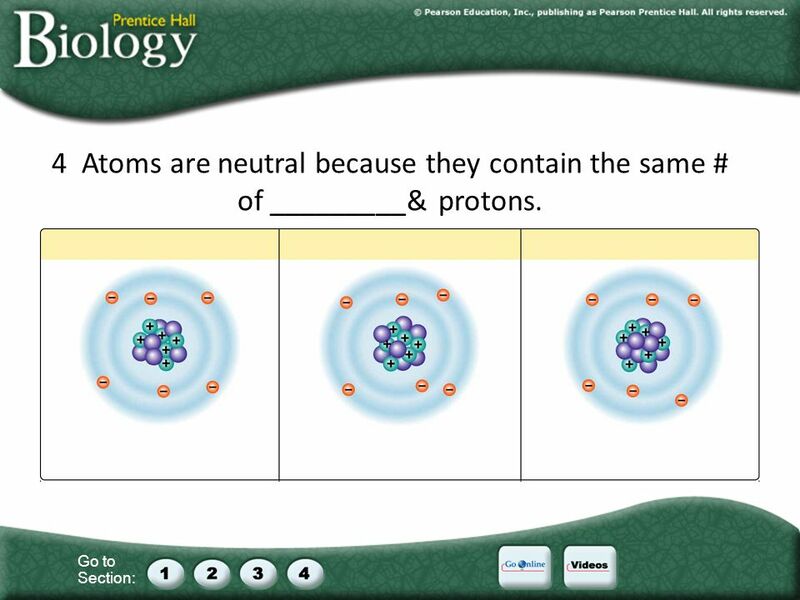 6 Go to Section: 4 Atoms are neutral because they contain the same # of _________& protons. 7 Go to Section: 4 Atoms are neutral because they contain the same # of electrons & protons. 8 Go to Section: 5 Chemical elements are groups of atoms having the same atomic number, that is, atoms having the same number__________. These are all atoms of Carbon. All have atomic #_____. 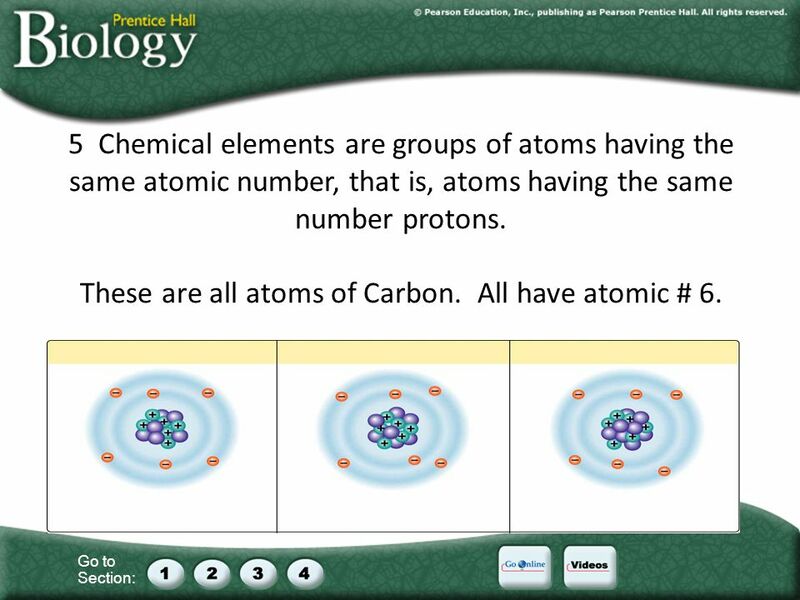 9 Go to Section: 5 Chemical elements are groups of atoms having the same atomic number, that is, atoms having the same number protons. These are all atoms of Carbon. All have atomic # 6. 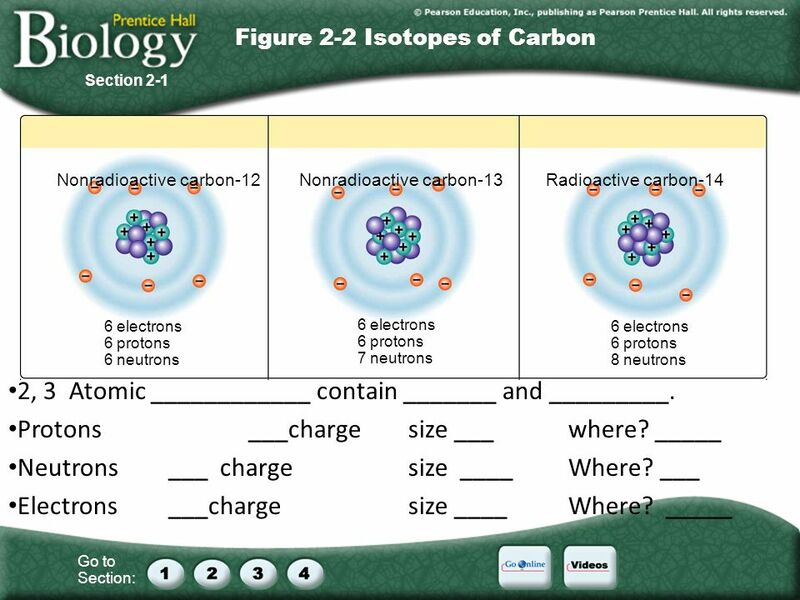 10 Go to Section: 6 C 12.011 Section 2-1 An Element in the Periodic Table 6. 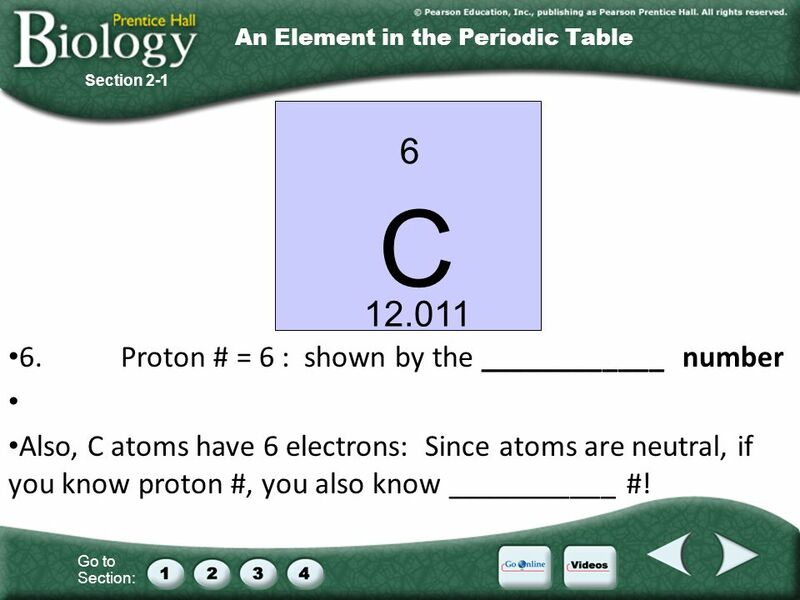 Proton # = 6 : shown by the ____________ number Also, C atoms have 6 electrons: Since atoms are neutral, if you know proton #, you also know ___________ #! 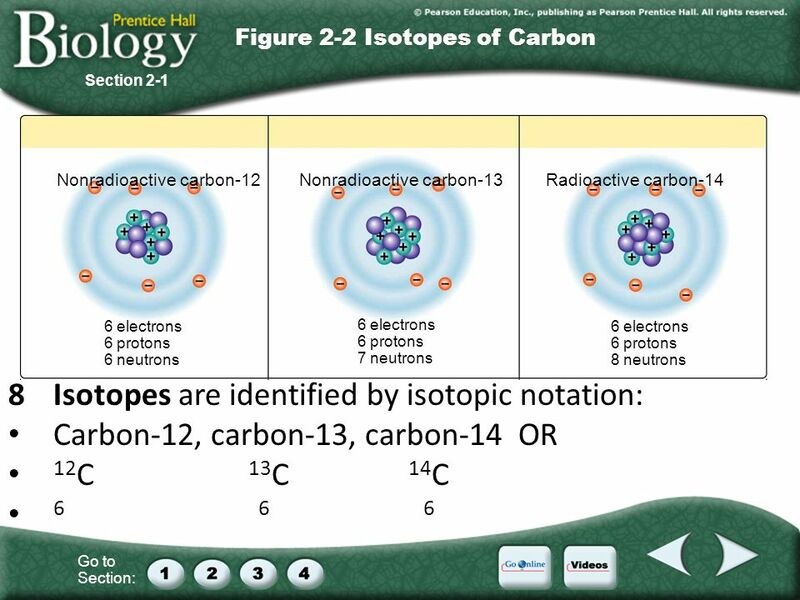 11 Go to Section: 6 C 12.011 Section 2-1 An Element in the Periodic Table 6. Proton # = 6 : shown by the atomic number Also, C atoms have 6 electrons: Since atoms are neutral, if you know proton #, you also know electron #! 12 Go to Section: Nonradioactive carbon-12Nonradioactive carbon-13Radioactive carbon-14 6 electrons 6 protons 6 neutrons 6 electrons 6 protons 8 neutrons 6 electrons 6 protons 7 neutrons Section 2-1 Figure 2-2 Isotopes of Carbon 7 Isotopes are forms of the same element that have the same number of protons but a different number of ______________. 13 Go to Section: Nonradioactive carbon-12Nonradioactive carbon-13Radioactive carbon-14 6 electrons 6 protons 6 neutrons 6 electrons 6 protons 8 neutrons 6 electrons 6 protons 7 neutrons Section 2-1 Figure 2-2 Isotopes of Carbon 7 Isotopes are forms of the same element that have the same number of protons but a different number of neutrons. 18 Go to Section: 10 Chemical compounds are groups of atoms held together by chemical ________. Chemical compounds are more stable than individual atoms (except for n_______ gas atoms which have stable ---filledvalence electron shells. Chemical compounds allow atoms to obey the _________ rule. (2 electrons in the outer electron shell in H and He, but 8 for other elements. 19 Go to Section: 10 Chemical compounds are groups of atoms held together by chemical bonds. 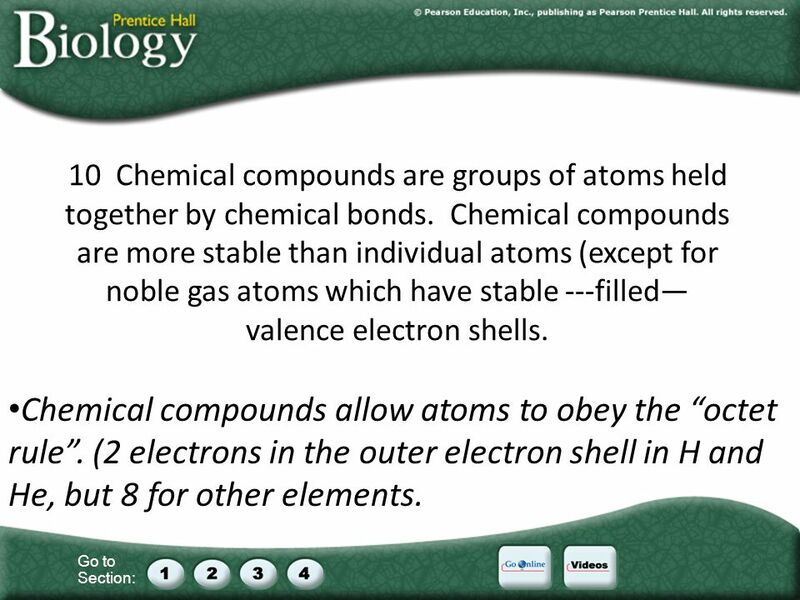 Chemical compounds are more stable than individual atoms (except for noble gas atoms which have stable ---filled valence electron shells. Chemical compounds allow atoms to obey the octet rule. (2 electrons in the outer electron shell in H and He, but 8 for other elements. 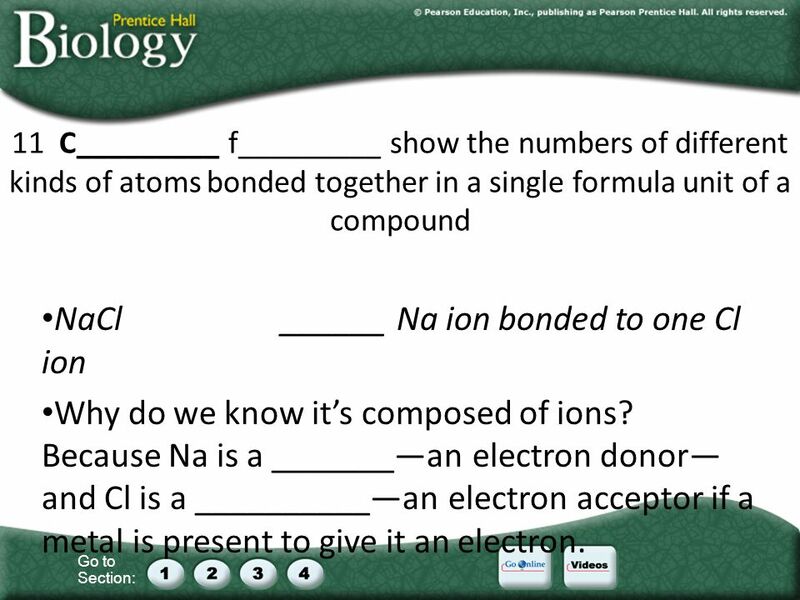 20 Go to Section: 11 C_________ f_________ show the numbers of different kinds of atoms bonded together in a single formula unit of a compound NaCl______ Na ion bonded to one Cl ion Why do we know its composed of ions? 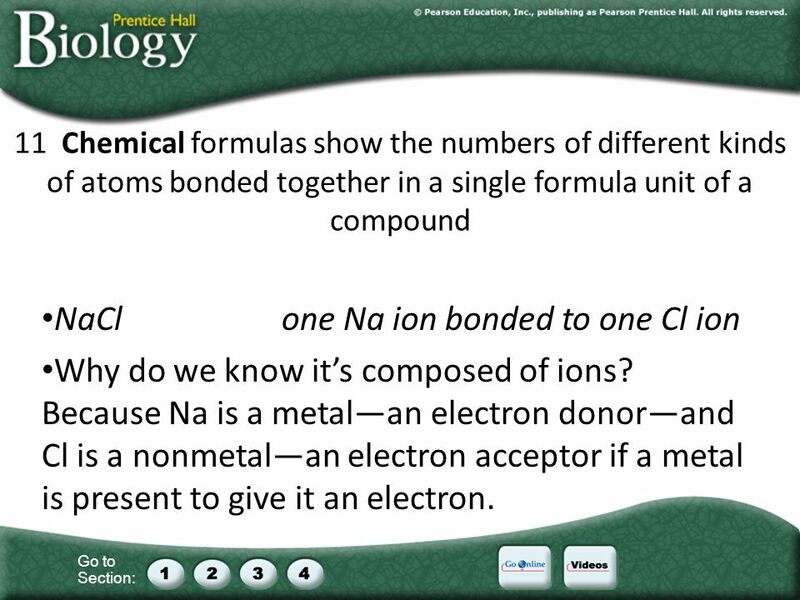 Because Na is a _______an electron donor and Cl is a __________an electron acceptor if a metal is present to give it an electron. 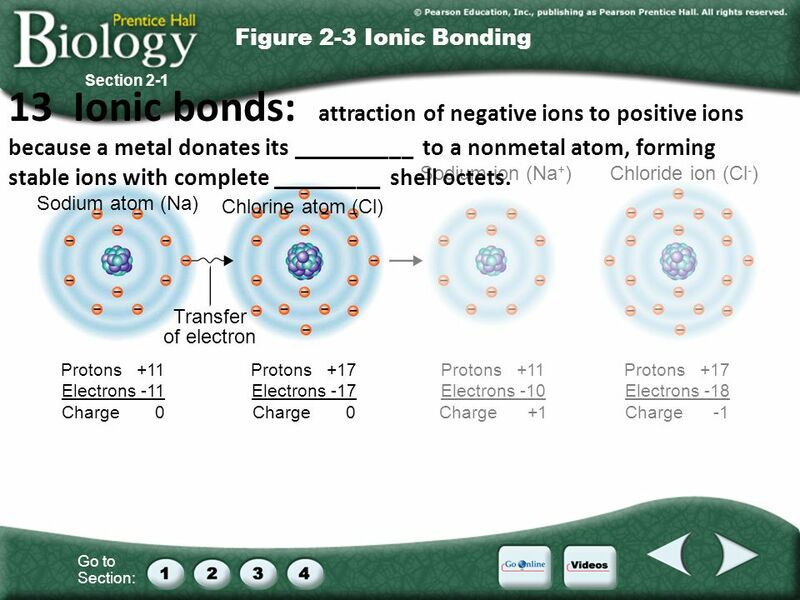 21 Go to Section: 11 Chemical formulas show the numbers of different kinds of atoms bonded together in a single formula unit of a compound NaClone Na ion bonded to one Cl ion Why do we know its composed of ions? Because Na is a metalan electron donorand Cl is a nonmetalan electron acceptor if a metal is present to give it an electron. 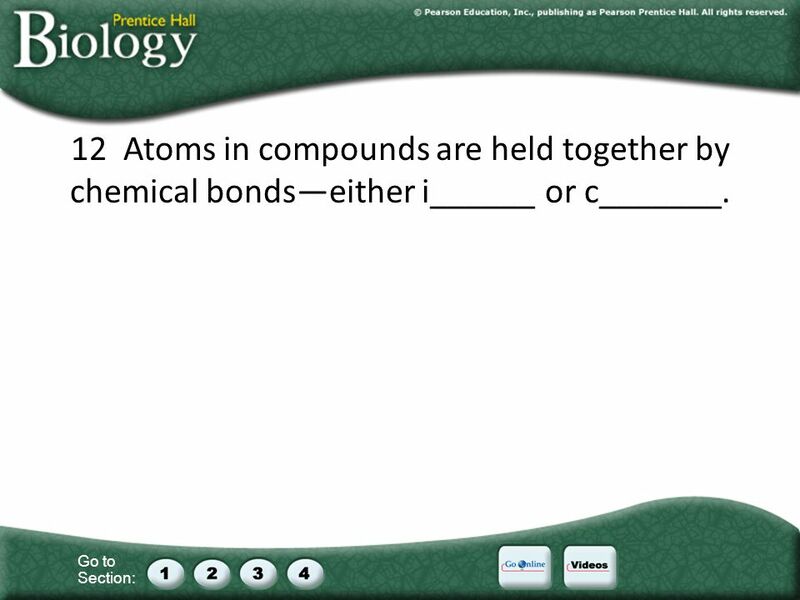 22 Go to Section: 12 Atoms in compounds are held together by chemical bondseither i______ or c_______. 23 Go to Section: 12 Atoms in compounds are held together by chemical bondseither ionic or covalent. 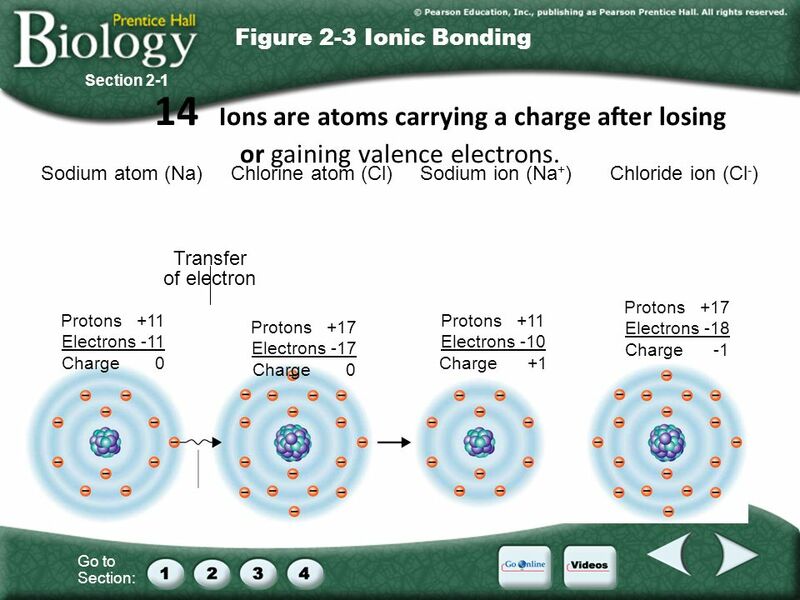 24 Go to Section: Sodium atom (Na) Chlorine atom (Cl) Sodium ion (Na + )Chloride ion (Cl - ) Transfer of electron Protons +11 Electrons -11 Charge 0 Protons +17 Electrons -17 Charge 0 Protons +11 Electrons -10 Charge +1 Protons +17 Electrons -18 Charge -1 Section 2-1 Figure 2-3 Ionic Bonding 13 Ionic bonds: attraction of negative ions to positive ions because a metal donates its __________ to a nonmetal atom, forming stable ions with complete _________ shell octets. 25 Go to Section: Sodium atom (Na) Chlorine atom (Cl) Sodium ion (Na + )Chloride ion (Cl - ) Transfer of electron Protons +11 Electrons -11 Charge 0 Protons +17 Electrons -17 Charge 0 Protons +11 Electrons -10 Charge +1 Protons +17 Electrons -18 Charge -1 Section 2-1 Figure 2-3 Ionic Bonding 13 Ionic bonds: attraction of negative ions to positive ions because a metal donates its electrons to a nonmetal atom, forming stable ions with complete valence shell octets. 26 Go to Section: 13 _________ bonds form when nonmetal atoms share electrons to fill their valence o_______, linking atoms because both nuclei attract the shared electrons. 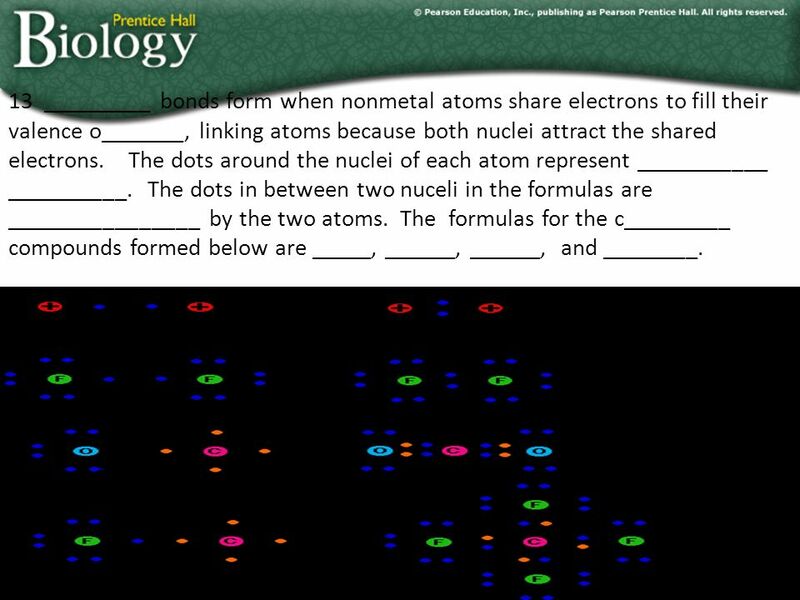 The dots around the nuclei of each atom represent ___________ __________. The dots in between two nuceli in the formulas are ________________ by the two atoms. 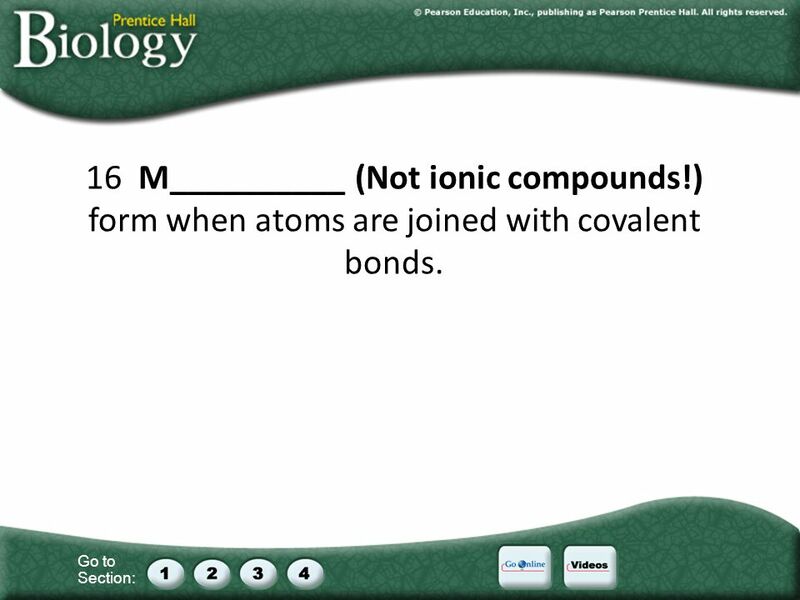 The formulas for the c_________ compounds formed below are _____, ______, ______, and ________. 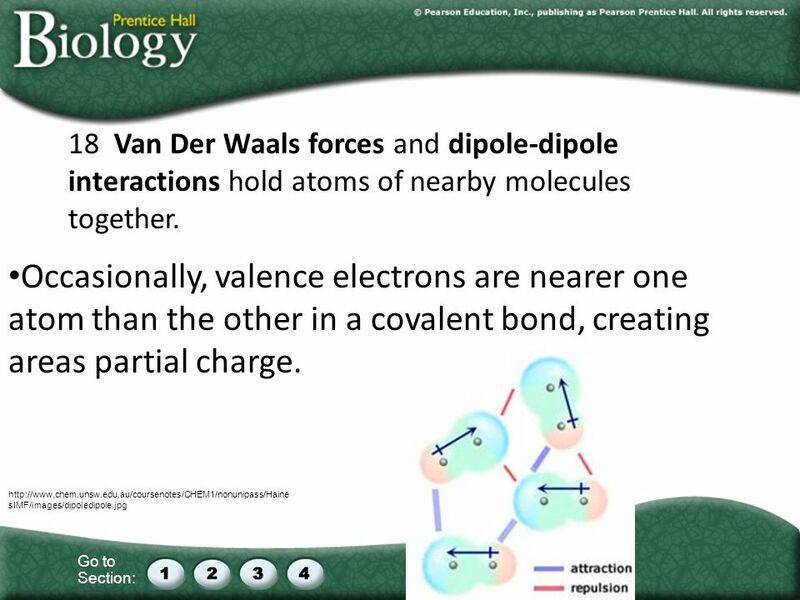 27 Go to Section: 13 Covalent bonds form when nonmetal atoms share electrons to fill their valence octets, linking atoms because both nuclei attract the shared electrons. 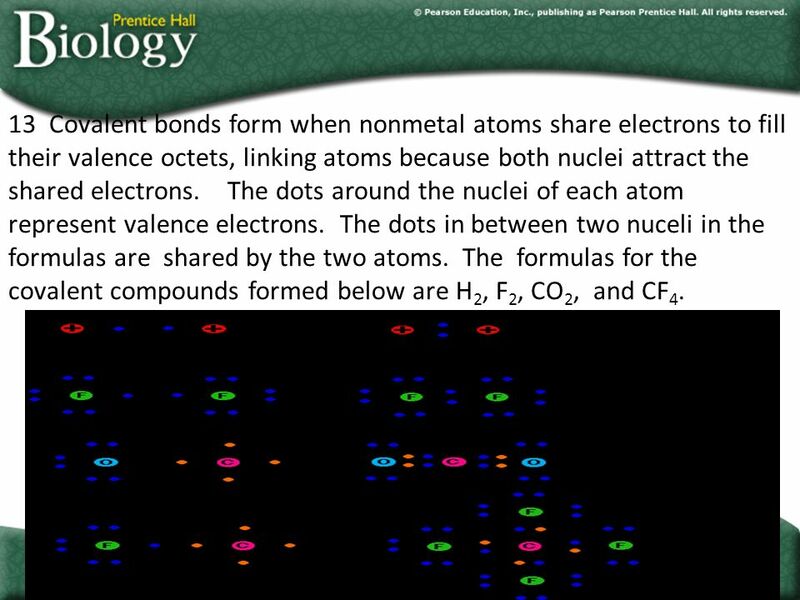 The dots around the nuclei of each atom represent valence electrons. The dots in between two nuceli in the formulas are shared by the two atoms. The formulas for the covalent compounds formed below are H 2, F 2, CO 2, and CF 4. 28 Go to Section: Sodium atom (Na)Chlorine atom (Cl)Sodium ion (Na + )Chloride ion (Cl - ) Transfer of electron Protons +11 Electrons -11 Charge 0 Protons +17 Electrons -17 Charge 0 Protons +11 Electrons -10 Charge +1 Protons +17 Electrons -18 Charge -1 Section 2-1 Figure 2-3 Ionic Bonding 14 _____ are atoms carrying a charge after losing or gaining valence electrons. 29 Go to Section: Sodium atom (Na)Chlorine atom (Cl)Sodium ion (Na + )Chloride ion (Cl - ) Transfer of electron Protons +11 Electrons -11 Charge 0 Protons +17 Electrons -17 Charge 0 Protons +11 Electrons -10 Charge +1 Protons +17 Electrons -18 Charge -1 Section 2-1 Figure 2-3 Ionic Bonding 14 Ions are atoms carrying a charge after losing or gaining valence electrons. 30 Go to Section: 15. True orFalse. 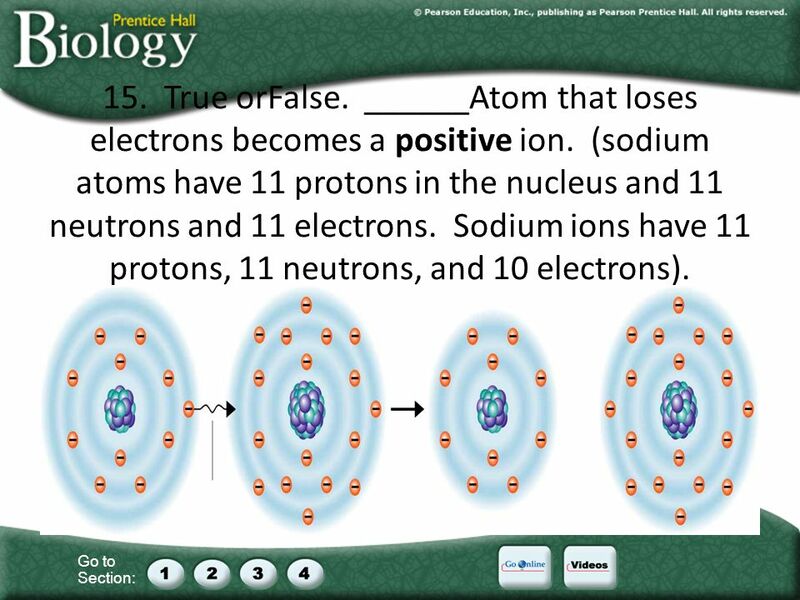 ______Atom that loses electrons becomes a positive ion. (sodium atoms have 11 protons in the nucleus and 11 neutrons and 11 electrons. Sodium ions have 11 protons, 11 neutrons, and 10 electrons). 31 Go to Section: 15. True orFalse. 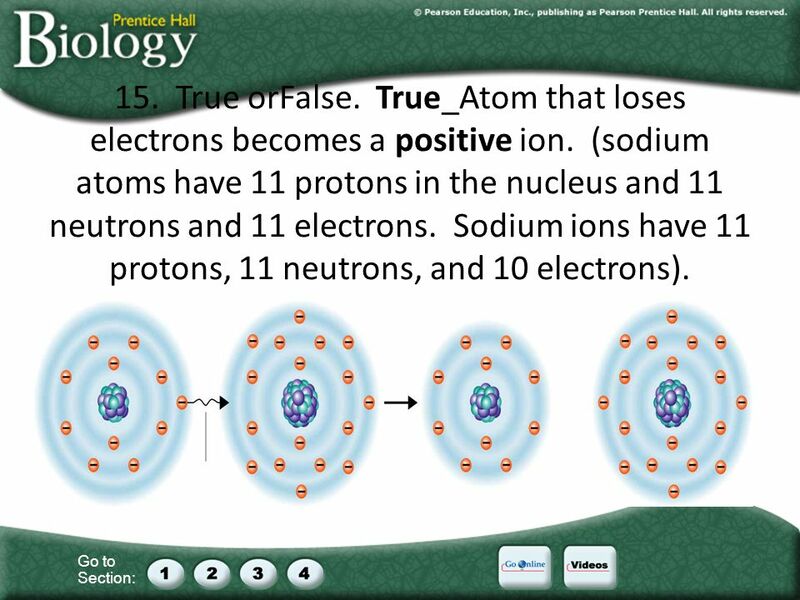 True_Atom that loses electrons becomes a positive ion. (sodium atoms have 11 protons in the nucleus and 11 neutrons and 11 electrons. Sodium ions have 11 protons, 11 neutrons, and 10 electrons). 32 Go to Section: 15. True orFalse. 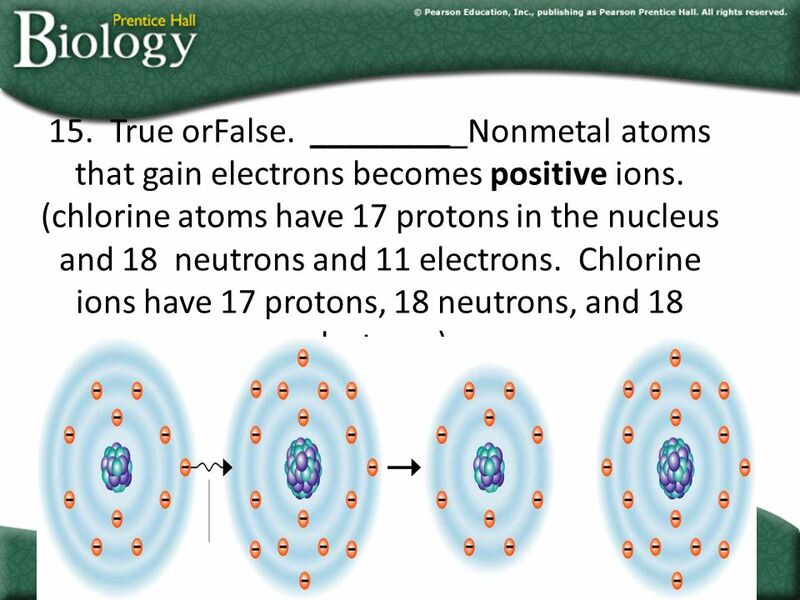 _________Nonmetal atoms that gain electrons becomes positive ions. (chlorine atoms have 17 protons in the nucleus and 18 neutrons and 11 electrons. Chlorine ions have 17 protons, 18 neutrons, and 18 electrons). 33 Go to Section: 15. True orFalse. 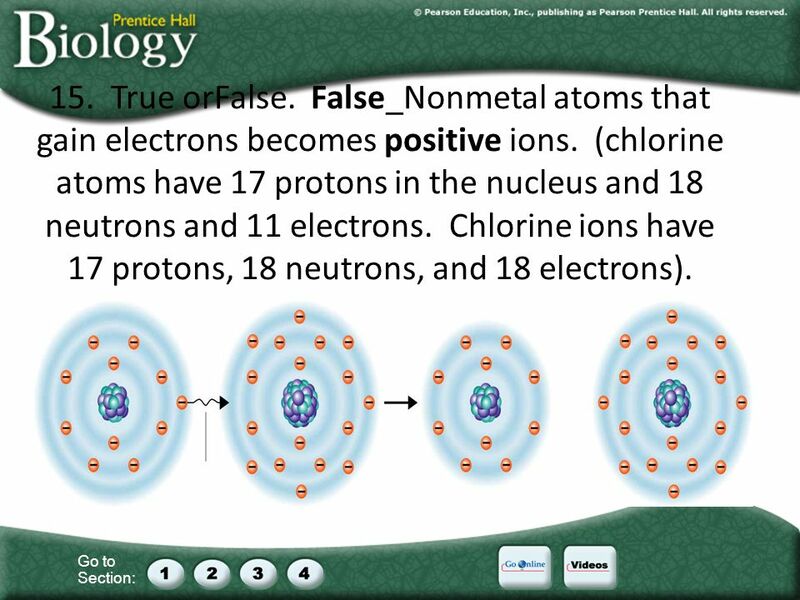 False_Nonmetal atoms that gain electrons becomes positive ions. (chlorine atoms have 17 protons in the nucleus and 18 neutrons and 11 electrons. Chlorine ions have 17 protons, 18 neutrons, and 18 electrons). 34 Go to Section: 16 M__________ (Not ionic compounds!) 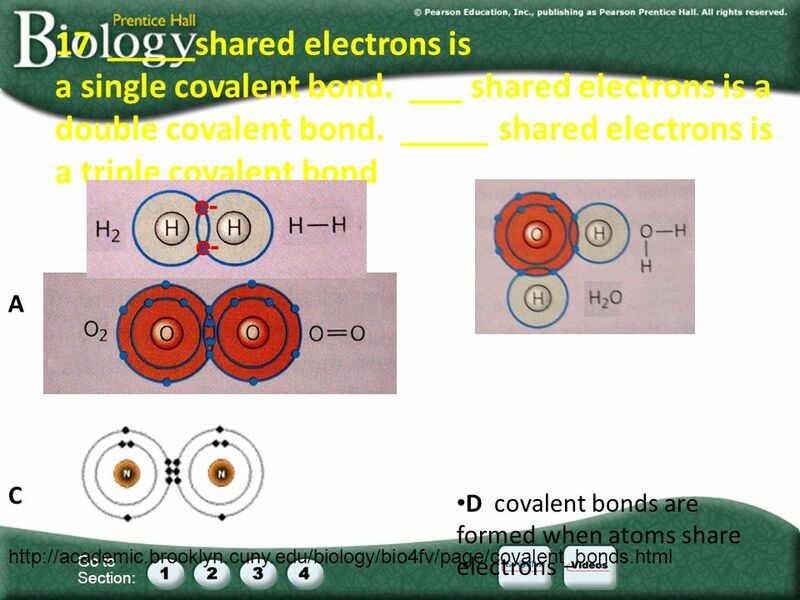 form when atoms are joined with covalent bonds. 35 Go to Section: 16 Molecules (Not ionic compounds!) 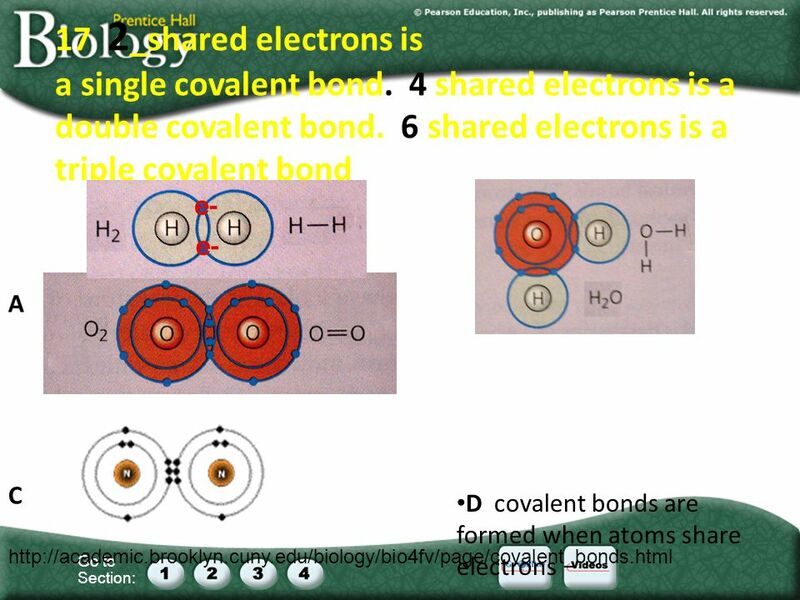 form when atoms are joined with covalent bonds. 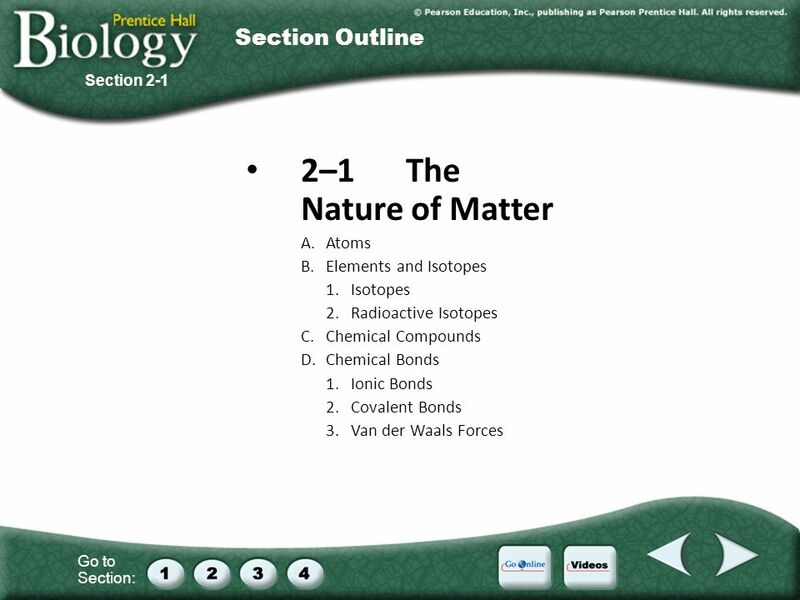 Download ppt "Go to Section: 2–1The Nature of Matter A.Atoms B.Elements and Isotopes 1.Isotopes 2.Radioactive Isotopes C.Chemical Compounds D.Chemical Bonds 1.Ionic." 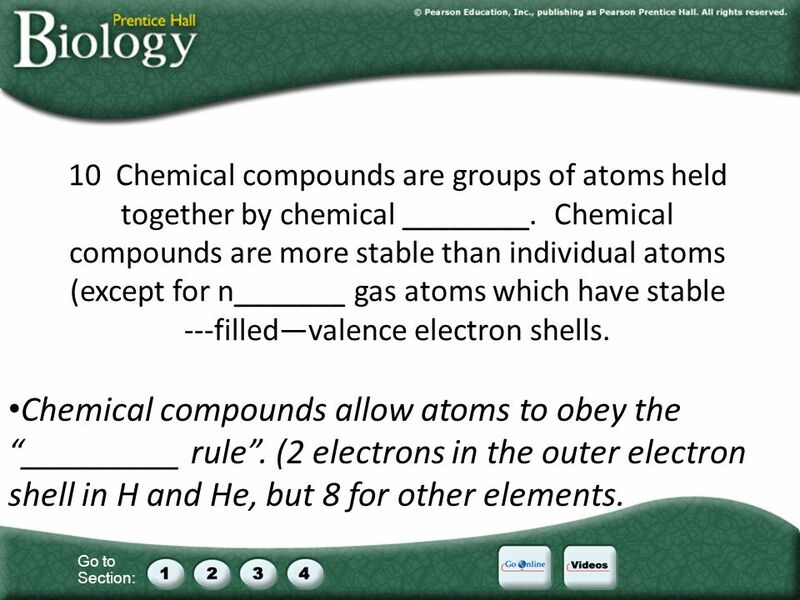 Chemistry, Part I Human Anatomy and Physiology I Oklahoma City Community College Dennis Anderson. Lecture 1.1 Refresh your high school chemistry CS882, Fall 2006. 1. Review- What is a compound Apply Concepts- Water (H 2 O) and hydrogen peroxide (H 2 O 2 ) both consists of hydrogen and oxygen atoms. Explain why they. Go to Section: Matter –Anything that has mass and occupies space 1 The basic unit of matter is called the atom. 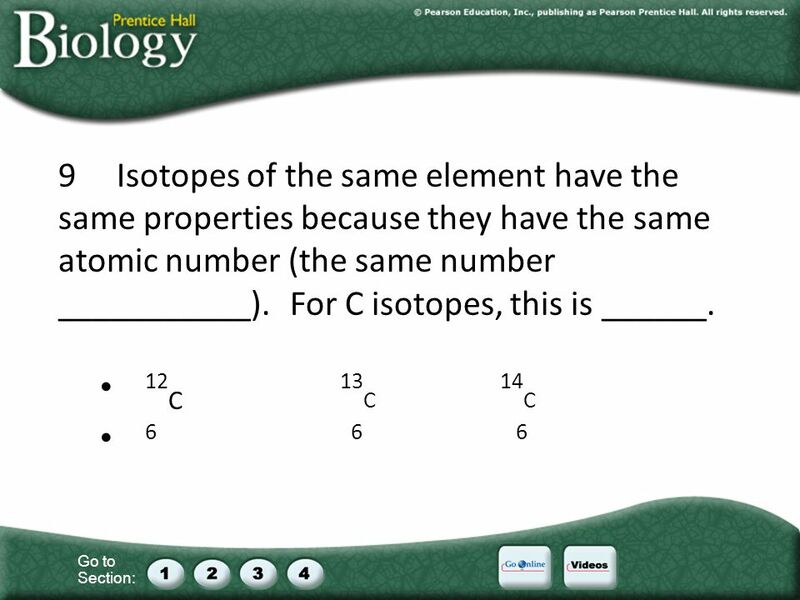 Atoms and Reactions Test 1a Biology. 1) ____________is anything that occupies space and has mass. Matter. Chemistry of Life Biology Chapter 2.